Thanks to our recently re-elected Mayor Nancy Shaver, Commissioners, City Manager John Regan and Public Works Director Michael Cullum for their efforts to understand, and invent solutions, for sea level rise and flooding in St. Augustine. Our Nation's Oldest City history and nature can and will be preserved with appropriate technologies, some as simple as by planting a "living shoreline" with mangrove trees around areas like Davis Shores and Vilano Beach. On this subject, mediocre, misguided, misanthropic St. Augustine Beach ex-Mayor SAMUELS showed her ignorance, once misstating in a joint SAB meeting, "There are no mangwove twees here." In fact, due to global climate change, the northern boundary of mangroves now lies north of St. Augustine, north of Vilano Beach on the unnamed barrier island. This fact led to the fourth international conference on mangrove trees and macrobenthos, held in 2016 at Flagler College, cosponsored by UF IFAS. Mangrove trees guard shorelines and take carbon out of the air and fix it into the soil. We need more reality-based, science-speaking and math-literate public servants like Nancy Shaver. Enough unscientific industry strumpets like RON DeSANTIS, RICK SCOTT, DONALD TRUMP AND MIKE PENCE. U.S. cities have been tapping into the expertise of Dutch researchers when it comes to dealing with flooding and sea level rise, and St. Augustine is among them. St. Augustine officials are in early talks with experts from Deltares, a water research firm with offices in the Netherlands and beyond, about planning solutions for the city. Research and planning for sea level rise in St. Augustine has ramped-up in recent years. Among other things, the Florida Department of Economic Opportunity chose St. Augustine as one of three communities to study for risks and possible solutions for sea level rise. The city has routine coastal flooding on sunny days with very high tides. Sea level rise poses a threat to city infrastructure and properties, and projections vary on how quickly it will happen. “I think as Americans we can engineer everything, but we don’t really know what to do when, and that is the value of getting a road map from these people who have done it for centuries,” Shaver said. The Netherlands is known for innovations in living near or below sea level. 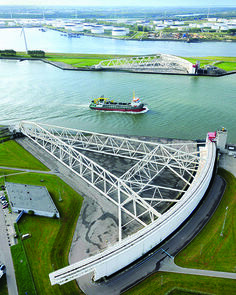 For instance, the Maeslantkering is a sea gate the size of two Eiffel Towers on the waterway that serves the port of Rotterdam, according to a New York Times article. Some Dutch projects combine water management with public spaces. “The Dakpark” is a dike that features a shopping center and rooftop park, according to the article. There’s also “the Eendragtspolder, a 22-acre patchwork of reclaimed fields and canals ... a public amenity that collects floodwater in emergencies” and which is below sea level. There are many options when it comes to dealing with flooding, such as seawalls, pumps and living shorelines. Research involving Dutch scientists is happening now on living shorelines on the Intracoastal Waterway in St. Johns County, said Christine Angelini, assistant professor of environmental engineering sciences with the University of Florida. The research focuses on how to maintain and preserve estuaries and marshes, Angelini said. The National Oceanic and Atmospheric Administration is supporting the research, and some experiments are taking place at the Guana Tolomato Matanzas National Estuarine Research Reserve, she said. Fifteen feet of marshland can absorb about 50 percent of a wave’s energy, according to NOAA Fisheries. As for the city’s efforts, St. Augustine Public Works Director Mike Cullum said the city is in early discussions with Deltares about planning. It’s not clear what the next steps are. Shaver said she shared projections for sea level rise with the firm during her visit. “I said, look, we have a $50 million budget. We’re the oldest city in America. We don’t have ... a lot of money,” she said. An official from Deltares couldn’t be reached for comment. Cullum said the firm has “excellent capabilities” for modeling scenarios for rivers and estuaries, but there are other sources for information. “In order to really understand what level you need to protect to, based on the type and level of storms, we kind of need one of these modeling tools,” Cullum said. The city is also in conversations with the U.S. Army Corps of Engineers about studying coastal flooding risk. Some city projects are already moving ahead. The city has installed about 20 of 100 valves for storm water outfalls in the city to prevent high tides from backing up into streets through storm water pipes. The city plans to install the rest over the next couple of years. The city is also planning on making flooding and drainage improvements to close to 200 acres downtown via the Lake Maria Sanchez Flood Mitigation project. That’s a multi-million dollar effort for which the city hopes to receive federal funding. Officials are also planning to raise sewage pumping stations so that control panels don’t flood in a storm, lose power and release sewage into waterways. The city is doing what it should be, which is looking at every option, Shaver said. Kuddos to Mayor Shaver!!!! YAY! So I have a mixed feeling...part of me truly wants Nancy to succeed and part of me wants to see all these rich white old, outdated and bigoted white men and women get flooded out...would serve them right!!! After all as our corrupt Governor points out there is no such thing as global warming...it is just a liberal scare tactic!